Here are a few hints on parts that are no longer available through GM or that were replaced by better components. Make sure you also check my Aftermarket parts page. 1984-1986 Fieros were equipped with an Aluminum clutch pedal that bent over time resulting in the clutch not fully disengaging and difficult shifting. 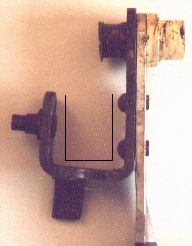 The picture shows a bent clutch pedal, the indicated part should be square. The new pedal is P/N #10066423 and makes a world of difference. The clutch pedal spring is eliminated and a new Master Cylinder Push Rod (P/N 10126424 for 84-85 ONLY or P/N 10126423 for 86 ONLY) and retainer clip (P/N 10040797) must be installed as well!. If you don't get the new pushrod, at least get the proper new bushing to accomodate for the different diameter pin on the pedal. The P/N is 1409 4900 and the price is under $2. Of course, don't forget to bleed your clutch system, trapped air is also a common cause for insufficient clutch travel. The manual transmission leather shifter knob is no longer available, but the knob from a 1987 Firebird fits and looks just like the original. The part number is 10126477 for a grey knob that is perfect and the cost is only about $50. The door hinge pins are no longer available, but they are a generic GM item (Chevy S-10). The Part number of the replacement is 20043351 (about $2.50 each). The retainers and bushings are still available (P/N 2042 9500, under $1 each). The part of the emergency flasher button with the white inscription (Part number 2250 7977) has been discontinued. A replacement however is part number 1233 7964. The plastic is flat instead of shiny, but otherwise a direct replacement. A common problem on A/C equipped V6 Fieros is the oil pressure gauge going berzerk. 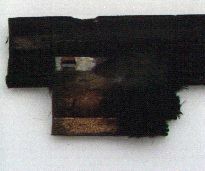 This is caused by water entering the oil pressure sensor through the vent hole in the plug. Installing a new sensor only cures the problem temporarily, because water will enter the plug again. To prevent this from occurring again GM recommends installing the oil pressure sensor filler plug P/N 1205 9168 in the hole that you see when you disconnect the plug from the sensor. This part costs less than a dollar. By the way, this problem does not occur on Fieros without A/C because the sensor is mounted horizontally on these vehicles, so water flows out of the vent hole and does not accumulate and enter the sensor. 85 GT's are also spared because the gauge is much slower than on Fieros with the extra gauge package. So the sensor goes bad on the 85's as well, you just don't notice it. If you're too late and your oil pressure sensor connector has rotten away, the original GM part number for the 84-87 oil pressure sensor connector is 1208 5529. The V6 distributor gear is said to be discontinued, but not so, the updated part number is 0198 5769, and it can be a cause for jumpy timing if worn (thanks to fellow listmember Rick Stewart). The V6 harmonic balancer/damper has been discontinued, but GM P/N 1408 5401 fits as well. The only drawback is that the timing marks are not in the right places. They are 60 degrees off, intended for an engine with the timing indicator on the other side of the block. So you either need to get the proper timing indicator (but setting engine timing will be near impossible, because the view will be obstructed), or you can do what I did: paint the existing marks black, and paint a new timing mark on the right spot. Although not discontinued (to my knowledge), did you know that the wiper motor from a 91 Blazer fits perfectly, even the intermittent function works? (Thank to fellow listmember Rick). This is probably one of the most common parts that break. It is the #1 cause for non-working cruise systems. Although this part is discontinued, GM makes a compatible cruise stalk with part number 2511 1290. It is flat black instead of shiny, but otherwise a direct replacement. Patrick Maloney is said to make a great enclosure for 8" subwoofers that fit in the stock location. If you have any information as to his whereabouts, please let me know! The Cold Start Switch GM Part# 1408 4318 is a Bosch part (0280 130 229) and you may be able to find it cheaper at an aftermarket store that carries Bosch parts than trying your friendly (yeah, right!) Pontiac dealer. On another car I used the white/amber lights from a Honda Jazz, unknown year. They fit even better than the ones from the Nissan, but the parking lights are 5W only instead of 10W on the Nissan. If you were wondering why your windows are scratched, you should get a new dew wipe! This is what happens: the pad that pushes on the window from the outside loses its padding, and the bare metal contacts the window, with the obvious results. If you don't want to buy new dew wipes, at least put some new padding on it so it doesn't scratch your windows anymore! Oh, the part numbers are 2060 6220 for the driver side dew wipe and 2060 6221 for the passenger side dew wipe. The Bosch O2 sensor part number 12014 fits the Fiero and supposedly works great. Thanks to Kai for this information. The original part number 305 9313 has been superseded by 272 4666. This is for all 85-88 Fieros. But there are only a few of those left as well, so an aftermarket replacement for 1/2 to 3/4 the price is Factory Air/Four Seasons Part Number 33181 (available e.g. at Pep Boys for around $75). The notchback plastic rear quarter windows break on almost all 85-88 Fieros (the 84 had glass windows), and the original Pontiac parts are getting very expensive these days. Paul McKibben makes perfect reproduction rear quarter windows for the notchbacks not only with stock, but also with custom graphics. And the price is more than reasonable. He also makes stock and custom Fiero decals, so check out his website by clicking here. A place called Fiero Heaven offers aftermarket fastback rear quarter windows for $99. I would like to hear some comments about the quality and workmanship of these panels, so if you have seen one, please let me know! Many interior parts that are subject to everyday wear and tear start to look torn and are no longer available through GM. This is especially true for the upholstery. Enter Mr. Mike's Fiero Upholstery! Excellent quality Fiero upholstery kits at reasonable prices. Check him out! If you know of other parts that are discontinued and know a replacement, please drop me a line!